There is a tide in the affairs of men, which taken at the flood, leads on to pork sausage. And we must take the current when it serves, or lose our profitability. If Europeans do that, it’s classical from Shakespeare’s Julius Caesar. If Russians do it, it’s trade war. 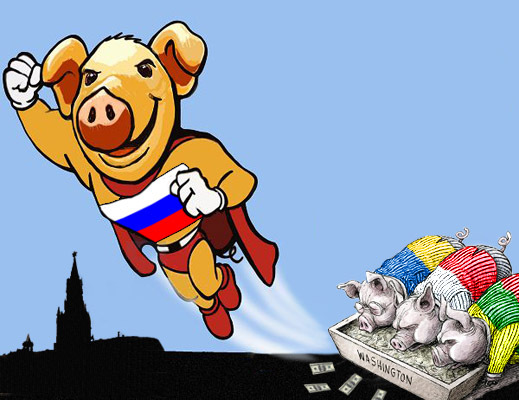 Oleg Tyagnibok, the Ukrainian oppositionist whom the US Government is promoting into power in Kiev, hasn’t been asked yet what he thinks of the Russian ban on European pork imports. But he’s bound to blame the “Moscow-Jewish mafia” because he’s blamed them before, though not exactly for trying to enforce the kosher code. The pork business is a sensitive one – not so much because it’s large in aggregate Euro or dollar trade value, but because the Russian market is the second largest consumer of pork imports in the world (Japan comes first) and the largest consumer of European Union (EU) pork; because pork production keeps farm voters happy in corners of Europe where their votes count in close elections; because in Russia itself the price of pork sausage is as sharp a trigger for voter discontent as the price of bread; and finally, because there has been a steady concentration of Russian pig farming and pork production into a handful of corporations and the men who own them, the porkligarchs. For the story of how unhappy they were at the loss of profitability inflicted on them since 2012, when Russia joined the World Trade Organization (WTO), read this. In the line-up of EU member-states with the biggest herds of pigs, Germany is the largest slaughterer, as well as the largest consumer and the largest exporter. 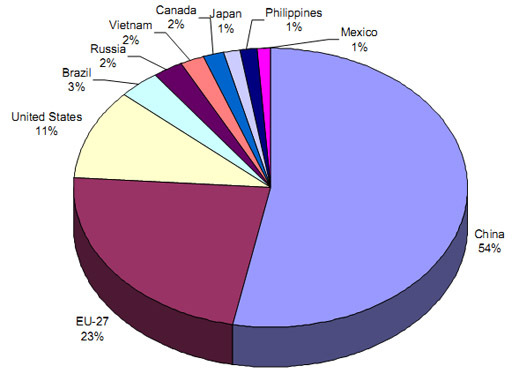 Spain, France, Poland, and Denmark are also big producers and exporters, and thus vulnerable to the Russian market. 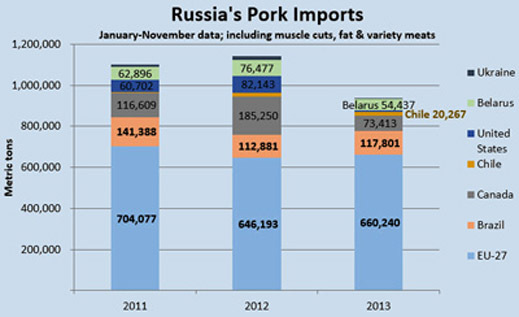 To feed the Russian appetite for pork, the alternative producer-exporters are China, the United States, Canada, Brazil, and maybe Vietnam. Since January 2013 US exports of pork to Russia have been banned for failure to eliminate residues of the growth chemical ractopamine. African Swine Fever (ASF) is a highly infectious, highly lethal disease which passes from wild to domestic pigs, and through the pig food chain. Its first detection in Russia was in 2007 (the disease originated from Georgia); since then the international Food and Agricultural Organization (FAO) has charted the history of its recurrence in this report. 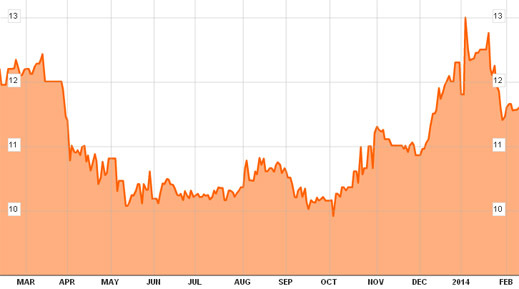 The charting was good through December 2012. The report predicted worsening outbreaks in western Russia during the seasonally warm months of backyard production, June through November. These materialized in mid-2013. As the maps show, the incidence was particularly acute in the western regions of Belgorod and Tambov near the Ukrainian border. When the outbreaks occurred, the EU issued a blanket ban of pig and pork product movement into the EU from all of Russian territory, including Siberia – which is off the FAO charts because there was no ASF outbreak. The EU immediately offered €2.5 million to Estonia, Latvia, Lithuania and Poland for what was reported at the time as aid to prevent the Russian infection crossing the border, moving westwards. No action was taken by the EU towards Ukraine. 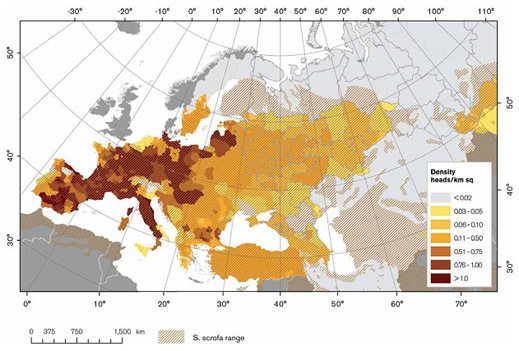 Wild boars can migrate over distances of 200 kilometres or more, and though the boar map shows they are relatively scarce in Russia, they grow increasingly more common in Belarus, the Baltic states, and central Europe. Whither the boar, thence ASF. Until last month, the Europeans believed themselves clear of the infection – except for Sardinia. RSN then introduced new import regulations, allowing pig-meat products heated to destroy ASF and pork covered by a new EU certificate. This was not a ban on EU imports, but it did set conditions for imports which the EU has until now refused to implement. The impact was momentous for the EU exporters. Belarus and Ukraine exports were unrestricted. In Borg’s political past at home on his Mediterranean island, he has attacked the EU for failing to do enough to help Malta cope with waves of illegal immigrants landing from Libya and other conflict zones in northeastern and northwestern Africa. The EU should accept a proportionate share of the immigrants, Borg claimed just before he took his Brussels appointment, and contribute more to naval patrols and other measures to turn back the flood. But Africans landing in Malta are a different story from boars landing in the EU. According to Borg’s statement of February 7, “Russia has imposed unprecedented trade restrictions on the export of pigs and pig meat from all 28 EU Member States, even though the occurrence of the disease is restricted to only a limited area of Lithuania. These restrictions, apart from having a serious economic impact on European business operators, are also disproportionate and contrary to international trade principles. Imposed two weeks ago by Russia, this trade embargo continues to apply despite an as yet unsuccessful request to meet my Russian counterpart… I repeat that in view of the reassurances provided, the surveillance and control efforts made, and the outstanding health status of all non-affected EU regions, a blanket ban is completely disproportionate”. RSN’s response was to remind Borg that it was maintaining the same “commitment to the principle of equivalence of the measures taken” as the EU had taken against Russian products during last year’s ASF outbreaks in western Russia. Borg had been the commissioner in charge then and since. In the interval RSN accuses the Europeans of failing to negotiate the new terms for the EU’s veterinary certificate and for the regionalization required on both sides of the border to curtail the infection risk. For voter consumption, Poland’s prime minister Donald Tusk has publicly accused the Russian government of starting a new trade war over pork. This is despite Tusk’s earlier success in negotiating the lifting of the two-year Russian embargo on imports of Polish meat products from 2005 to 2007. Polish, Lithuanian and other eastern European politicians claim the RSN action on swine fever is retaliation for the EU’s support of the anti-Russian opposition in Ukraine. Other European supporters of the Ukrainian opposition also accuse Russia of waging trade war on imported chocolates, dairy products, and tulips. Lithuania has applied for $6 million from EU headquarters to erect a new fence to stop Russian boars from crossing. Latvia and Poland are also expected to put in for fencing money. Borg’s claims that Russian measures have been disproportionate fly in the face of EU protectionism to keep out Brazilian pork, argues Yushin. The EU record shows that for years now the EU has refused to accept Brazilian proposals for regional containment of veterinary infections, on the basis of which the European Commission has imposed import bans. “Therefore, the [Russian and EU] measures are exactly symmetrical,” says Yushin. “The last case of ASF in Brazil was in 1981. [The European] ban on the import, in particular pork, from Brazil is still active, and for the whole country. So the ban is already in force for almost thirty years.” For independent evidence of Brazil’s efforts to contain and eradicate ASF, read this. European prices on the pig slaughter market have been falling for two weeks now as the volume of unsold meat is counted which must be disposed of on the European side of the Russian frontier. 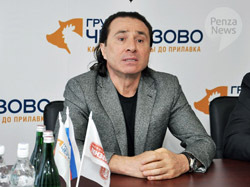 On the Russian side, two of the largest domestic pork producers are Cherkizovo, which is listed on the Moscow and London stock exchanges and controlled by Igor Babaev (right); and Miratorg, which is privately owned by the Linnik brothers. Market capitalization for Cherkizovo is currently $766 million. It has been higher – $1.2 billion in September 2010.